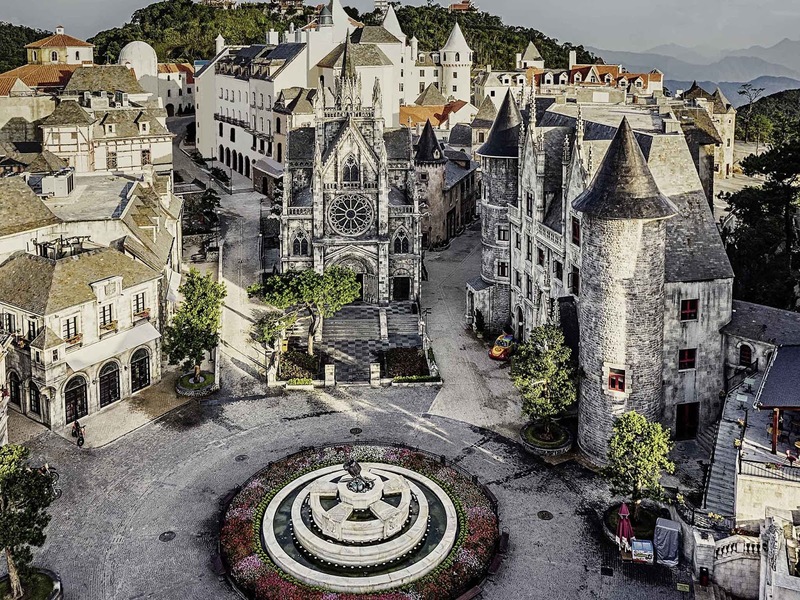 The French Village was inspired by the French homeland of Pigneau de Behaine, the first foreigner to visit Ba Na Mountain. The area was a historical french retreat area in the 1800’s. The Ba Na Cable Car is the longest single-wire cable car in the world. Ba Na Hill is known as “The Green Lung” of Da Nang City. The ba na flower is unique to this area. 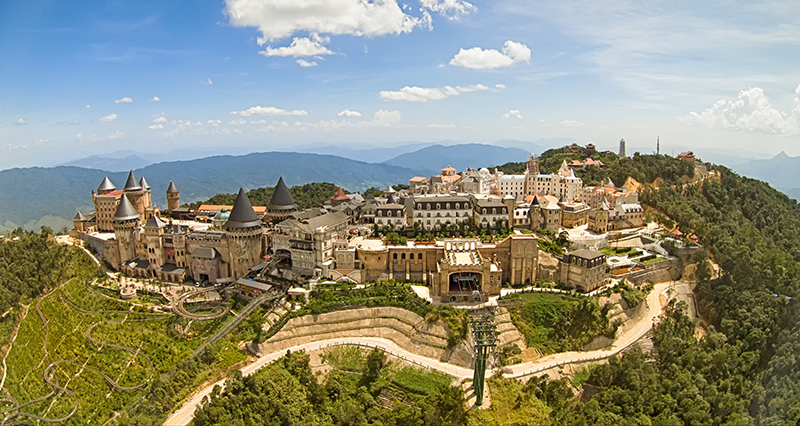 DDP Projects joined forces with Sun Group, a pioneering Land Development Company based in Vietnam, to create a World Class Themed Resort Complex a top the beautiful Ba Na Mountain in Central Vietnam. This triumph of Partnership Development is called the Ba Na French Village. 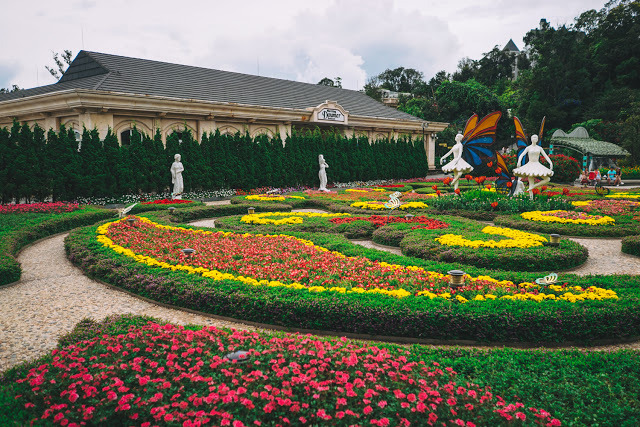 Ba Na French Village is a luxury hotel complex and multi-use tourist destination located at the top of Ba Na Hill Mountain just outside Da Nang, Vietnam, designed in the style of a 19th century French Villa. The resort features 494 bedrooms, a variety of cafes, bars, restaurants and cultural attractions, as well as a luxury spa, swimming pool and access to the famous Ba Na Hill Cable Car. The complex covers over 45,000 square meters at an elevation of 1,400 meters. How did DDP go beyond developing a standard resort complex to create a majestic and breathtaking recreation of a 19th century French Villa, complete with classic courtyards, elaborate gardens, stone walls and a fully realized castle? Upon completion of the concept design by Falcon’s Treehouse, DDP was responsible for completing all Schematic Design and Detail Design phases of the project. Over the years, DDP has created a top tier alliance network of Entertainment Design Specialists with which they can orchestrate to insure the highest quality production for every high-concept design. After all, DDP founder Philip Hocking came from the leader in the Entertainment Design industry, Falcon’s Treehouse, the principal design firm on this project. An innovative design company out of Orlando, FL that specializes in immersive adventure experiences, ranging from narrative amusement park rides to themed hotels, museums, zoos, aquariums and virtually any venue with a desire to tell a story. Named “2017 Specialty Contractor of the Year” by Engineering News-Record (ENR) California, KHS&S is an international design-assist specialty building company that has pioneered innovative project management across the globe. They’re portfolio covers casinos, state-of-the-art theme parks and attractions, hospitals, public works projects and practically any other project requiring the most advanced and efficient methods of streamlined coordination for large-scale projects. The focus of this design is primarily on the exterior look and feel of the French Village. When the visitor first arrives at this mountaintop complex, they immediately experience a feeling of being transported to a medieval village in another century. In order to provide an immersive experience, we had to carefully craft every detail. DDP understood the sensitive nature of Themed Venue Design and provided critical recommendations outside the initial bid scope, such as the combination of hardscape and landscape designs. Hardscape designs were integrated with landscape designs such as pedestrian surfaces, stair and handrail details, fountains, gazebos, pottery and so on right down to the specific trellis and groundcover to further insure a cohesive overall design and immersive impact. DDP understands that consistent progression is a great value to their client. Through their integrated development process, they successfully streamlined successive components required for a project of this scale and quality to keep the overall vision intact. As the Construction Administration Phase began, a shift of authority from Falcon’s Treehouse to KHS&S took place, with Falcon’s Treehouse remaining on-site to advise KHS&S throughout the construction process. Because of the superior relationship and unique synergy between the teams, Falcon’s Treehouse will remain available to support KHS&S during the Construction Administration phase, benefiting the final realization of the French Village. The presence of KHS&S’s on-site supervision team insured that construction goals were met on time, on budget and with quality guaranteed. Informing the contractors about relevant matters such as Client approvals and revisions. Providing the Client notifications and recommendations concerning any obstacles that may affect the progress of the project. KHS&S also provided “As-Built” Drawings in reproducible and electronic format, which showed construction changes based on information supplied by contractors and/or obtained by the consultants. DDP has forged lasting alliances over the years. From industry leaders and specialists focused on High-Concept, High-Quality and High-Efficiency design and management, DDP utilizes the best, both in-house and from its wider network, streamlining the most complex design projects while retaining their client’s original vision. Ba Na French Village shows DDP at the peak of their strengths.